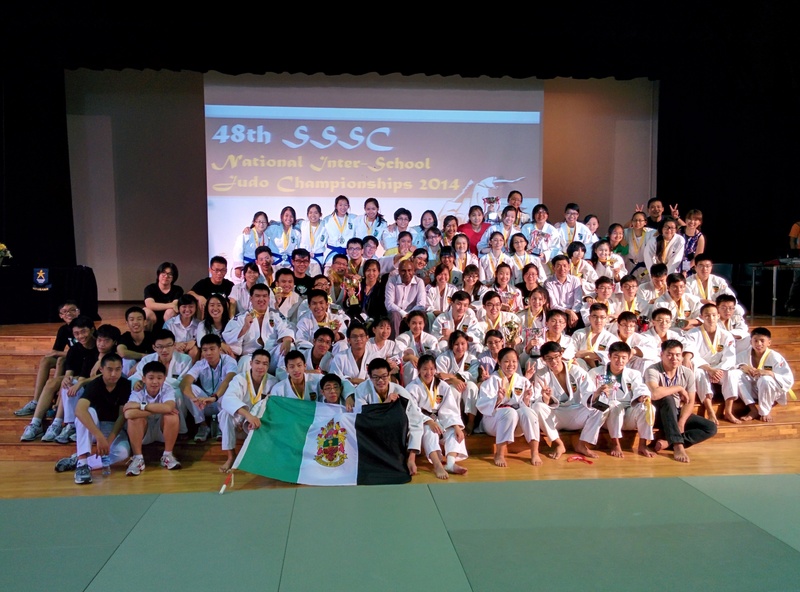 A few weeks back, RI’s Judo A Division team headed down to Hougang Seconday school for the National Schools Judo Championship. After defeating Nanyang Junior College in the semi-finals, our Judo boys and girls were set to face off against one of our fiercest rivals, Hwa Chong Institution (HCI) in the team finals. Despite having faced HCI in previous years of the competition, the team was well-prepared and confident for this encounter in the finals, having trained extensively in the months leading up to the National Schools Championship. This year’s team finals indeed showed that the Gentle Way did not necessarily mean a gentle fight. The atmosphere as both schools got ready for the team final was tense and fierce, with both judo teams performing their club cheers with pride. The format of the team event consists of five bouts played between opponents, with one member from each weight category. Each bouts lasts for three minutes, during which players aim to score an ippon. The victor of the event is determined by winning three out of five bouts. This did indeed set the stage for a suspenseful and exciting match for both the A Div boys and girls teams. The first match was between the A Division girls of RI and HCI. 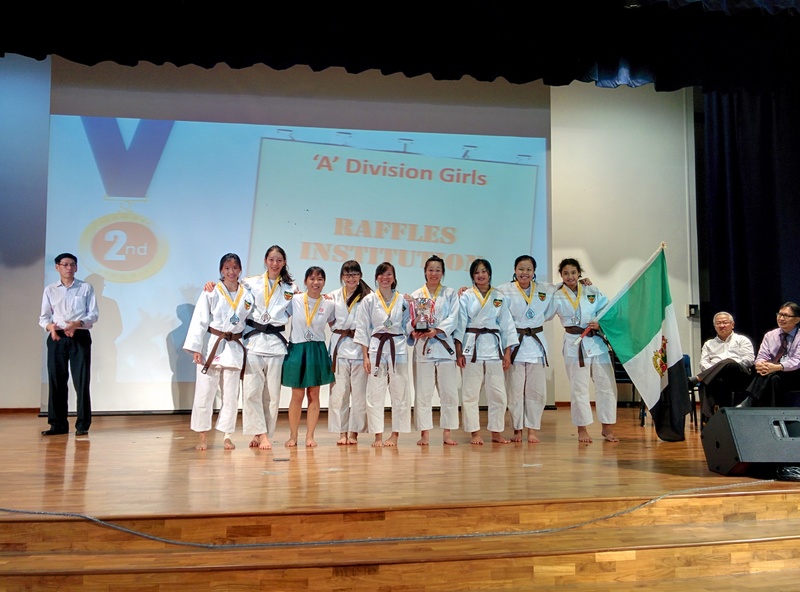 The line-up for RI’s A Division girls by weight category consisted of Cheong Hui Shyuan (-48kg), Amanda Chia (-52kg), Tania Forichon (-57kg), Joey low (-63kg) and Joyce lee (+63kg). The opening match was easily won by Huishyuan, catching her opponent off guard while they were fighting for control over each other and ending the bout with several nicely-timed foot sweeps. The second bout witnessed Amanda fighting valiantly, with her best effort. Both players were locked down gripping each other, but her opponent attempted a throw and managed to bring Amanda down to the floor. Her opponent pinned her down, and in spite of her best efforts at trying to bridge her opponent over, Amanda lost the second bout through groundwork. With the current score even at 1-1, the third bout started with both Tania and her opponent playing aggressively, vying for a hold on each other. While there were a few close calls where Tania was almost thrown by her opponent, or pinned down after being brought to the floor, she remained composed and was able to parry each attempt. After a stalemate in groundwork, the referee resumed the bout anew at the centre of the arena. Tania seized the opportunity as her opponent went into defensive play, and threw her swiftly with a back throw, winning the bout for the team. The fourth bout saw Joey putting up a strong fight against her opponent, with plenty of attempts by both parties to throw each other. Scores were awarded to both of them as the bout progressed. However, as the bout dragged on, Joey and her opponent engaged in a lot of intensive groundwork, each trying to pin down the other. Despite some considerable effort and spirit on her part, Joey narrowly lost to her opponent by points at the end of the bout. The last bout of the A Div girls team event was a nail-biting one as it was the last deciding bout for both schools in order to clinch the championship. Supporters from both Judo clubs rallied in support of their judokas. The match started in a flurry of aggression, with both Joyce and her opponent engaged in heavy groundwork – resisting each other while simultaneously seeking to pin the other down. However, Joyce was unfortunately caught off guard at a key moment, resulting in her getting pinned down by her opponent. Although Joyce tried her best to break free of the hold and bridge her opponent over, she was unable to do so and lost the bout. Hence, with a score line of 2-3, RI’s A Div judo girls conceded victory to HCI for the team finals, coming in second and winning the Silver title for the school. Regardless, their effort was no less laudable and their team spirit really showed through with the immense support their batchmates provided throughout all their trainings together. The next match for the day was the A Division boys’ team finals, which showcased a spectacular display of skill from both schools. The line-up for RI’s A DIv boys by weight category consisted of Davis Yep Swee Kiat (-60kg), Ong Jia Xiang (-66kg), Julius Sander Nugroho (-73kg), Henry Neo Jin Hong (-81kg) and Wei Yong Ji (+81kg). The first bout for the A Div boys saw Davis being pitted against his counterpart in the Feather weight category. Catching his opponent off guard, Davis managed to counter his opponent and was awarded a score. His opponent eventually went on to concede two fouls through defensive play. Davis won his bout by points at the end of three minutes. Jia Xiang played the second bout, with both players fighting each other for dominion over the other and grappling to throw each other. Unfortunately, while Jia Xiang played really well, he was brought down to the ground and subsequently pinned down, losing the bout. With the score at an equal 1-1, Julius entered the third bout, facing up against HCI’s captain. The first point was awarded to Julius as his opponent conceded a foul for overly-defensive play. However, Julius was penalised shortly after for the same reason. The next point of the bout was awarded to Julius for a small throw, but the score was quickly equalised when his opponent threw him for the same score later on in the bout. With time running out, Julius caught his opponent off guard with a massive throw, scoring a major point. The bout was thought to have been won by Julius when in the final five seconds of the bout, HCI’s captain threw Julius for a major point that sealed a win for HCI. The fourth bout featured RI’s Judo team captain, Henry who took an early lead with a foot sweep early on in the bout. He then went on to secure a win for the team by throwing his opponent, getting a full ippon. Once again, the A DIv boys’ team finals proved to be exciting and nerve-wracking as well, with the score being equalised at 2-2 for both RI and HCI. The last bout would again be the deciding factor for the championship. The last bout of the A Div boys’ team finals was nail biting from start to finish, as supporters from both RI and HCI yelled words of encouragement to both players. The early start of the bout saw Yongji conceding a small point. This was slightly demoralizing, but Yongji rose to the occasion, turning the bout around by throwing his opponent and following up with a pin. The hall of Hougang Secondary School was filled by cheers all around as Yongji secured the win and the championship title. Hence, with a score line of 3-2, and after an intense showing by both RI and HCI, our A Divison judo boys brought home the championship title for RI. The good showing of RI’s Judo A Div team was the result of months of training and encouragement from their coaches, Mr Tan and Mr Low, as well as the teachers, Mr Kok, Mr Eng and others. 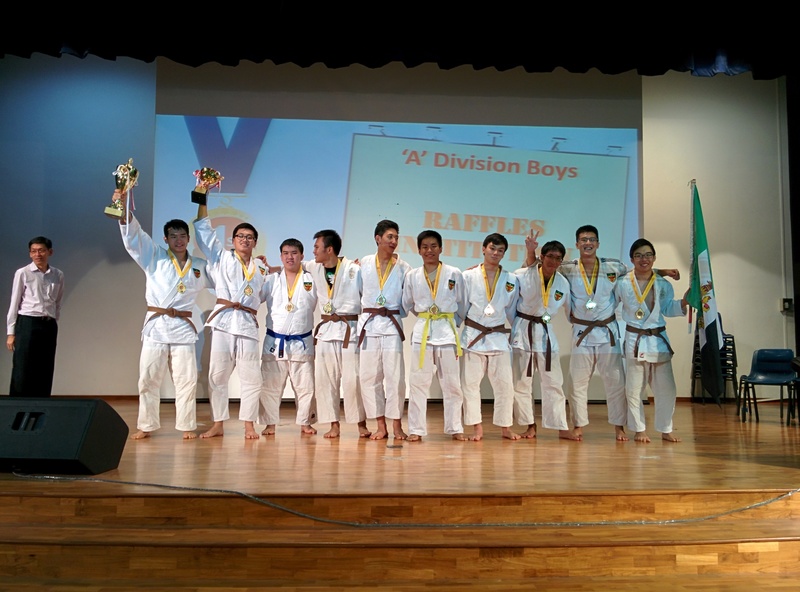 Raffles Press would like to congratulate the A Div boys and girls judo team for their stellar performance in the National Schools Judo Championships. Here’s wishing all sports CCAs the best of luck in the upcoming 2014 season.